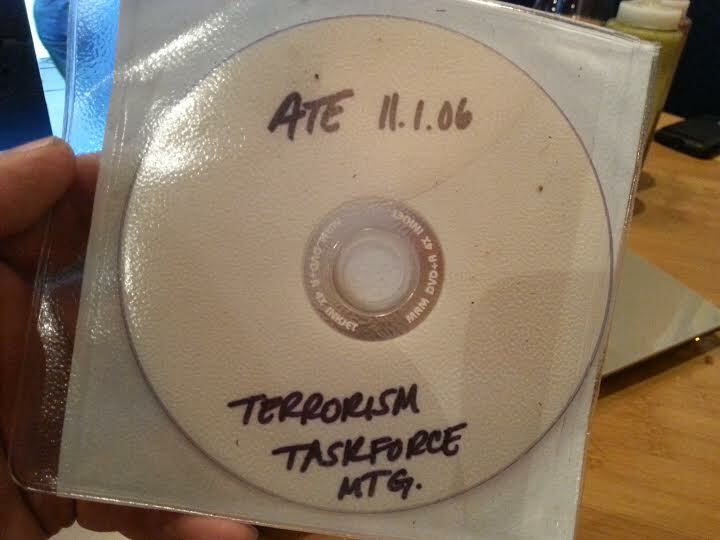 I saw a DVD on the ground at the Kearny Mesa dump with a label that read: “TERRORISM TASKFORCE MEETING.” I hardly expected Snowden-level revelations, but I was excited to get the disc to a computer and view the contents. It turns out that it is an internal SDPD video for training cops how to investigate and search people they’re pulling over even if they’re citizens who have committed no crimes. A plain clothes officer speaks to a classroom full of LEOs (LEO, law enforcement officer) in traditional blue uniforms, and random bureaucrats. The instructor then plays a training video that depicts the SDPD doing a traffic stop on a vehicle with two white guys in blue shirts and denim pants. As the car is pulling to the side of the road, the driver nervously passes a device to the passenger who stuffs it under his seat. The cops instruct the men to exit the vehicle and sit on the sidewalk. The police proceed to interrogate the men (who have terrible Russian accents). An officer gets verbal consent to conduct a search of the vehicle, where he finds a video camera. Although there’s nothing illegal in the footage, the LEOs are concerned that the content is suspicious (when viewed through the fearful eyes of the War on Terror). The DVD is essentially an instructional video that promotes viewing constitutional rights as an obstacle to policing and encourages snooping on people who have committed no crime but are potentially suspicious in the mind of a police officer. Previous Previous post: Reviewer TV: David J (Bauhaus, Love And Rockets) on his book, WHO KILLED MISTER MOONLIGHT?